With the fast development of tools and tagging schemes, and with more and more players contributing to and using OpenStreetMap, staying informed about everything important happening in the OpenStreetMap universe has become a time consuming process. Since 2010, the German OSM community has been addressing this issue and publishing a weekly OSM summary “Wochennotiz“. Many of the German weekly summaries were quickly translated into English. But now, after 220 issues of Wochennotiz and 100 translations, things have changed. An international team is starting to create an international weekly summary, based on the German OSM summary, thereby making it accessible for native speakers of English, Spanish, Turkish, Romanian, and Japanese. We are pleased to interview members of the weekly OSM summary team. This interview is available in English, German, Spanish, Romanian, Japanese, and Turkish. WN: Manfred, you are well known to the German OSM community and you are the head of the translation team. How did you get to know all the members of your team? Who are your team members? And who came up with the idea to translate the weeklyOSM summary into different languages? How does your team communicate with each other? Manfred (aka derFred), Germany: I am not the head of the translation team. For the EU and in the Comenius project “My community and my history in OSM”, I am the coordinator. In the weeklyOSM I am a “primus inter pares” because without teamwork such a project like this Comenius project never works. 😉 Along with Madalina from Romania, my school worked in a former Comenius project called “BoostOSM”; the idea really was to give OSM a “boost” in several countries, such as Portugal, Slovenia, Romania and Turkey. If you have a look on the wiki, you can see a lot of results produced by this project, which was ultimately selected as a Star project in 2013. As we worked very well together we decided to continue our work on OSM but with a different focus. Unfortunately the Turkish, Romanian and the Slovenian partner were not allowed to participate and so we had to look for other partners. We found excellent partners in the UK and in Spain. A new Turkish school joined us half a year later. This is briefly the story of the partners. We worked very well in translation and localisation of software related to OSM and so the idea to continue with our former Romanian partner was born. To continue Pascal’s weekly was accepted directly by all partners, because they saw that the translation of the Wochennotiz into our partners’ languages could be a key way of giving OSM more visibility. WN: This project is ambitious and has the potential to facilitate communication processes between the various national OSM communities. Does the Comenius program of the European Union also include financial support? If so, do you already have plans as to how the team could spend the money? And how do the contributing schools benefit from this project? Manfred, Germany: Well, I know from the Wochennotiz that a lot of people are waiting each week for the latest news to arrive. So I could imagine that this news would also be interesting for people who do not speak either German or English. As I lived for a while in Latin America, I know that a Spanish version (and maybe a Portuguese translation) would be very helpful for the communities and the mappers over there. As for the financial support: The Comenius program gives participating schools a certain amount of money for a number of obligatory visits (called mobilities) that they have to fulfill. The money in our last project didn’t cover the costs incurred by students and teachers for these mobilities, so they all had to contribute money from their own wallets. Consequently, we have not had to think about how to use any funds left over;-) Indeed, the project has had to say “thank you” to OpenSaar for sponsoring the actual web presence. WN: Do you have already plans for the time after the end of the funding period? WN: Who will actually translate the weekly osm summary? How will the process roughly work? Andrew, United Kingdom: I have the privilege of taking Manfred’s already excellent English, and just checking it for the odd typo. I got involved in the project when our academy became one of the main partners last year. Our pupils have benefitted greatly from this very interesting project, and I hope we can continue to involve them over the coming years. WN: How much time will it take to produce the international versions from the German weekly OSM summary? Do you have already a rough estimate? Carlos, Spain: We try to organize our task according to the weeklyosm issues; when we know that the English version is available, we set aside time in the day to work on translating and correcting the Spanish weeklyosm issue. In our case, the students involved in the project do the “translation draft” and, once the translation is ready, we meet up to correct the draft and to discuss any questions related to the process. The whole task can take us two or three days. Sometimes it is hard to find the right word in Spanish, but this isn’t a problem; the students are used to working with technical words and, in this case, they can grasp the meanings more quickly than I do! We don’t want to compromise the quality of the translation; we are very keen on doing a good job because it is worth it! WN: The German version of the weekly OSM summary sometimes contains information which might be only relevant for the German OSM community, such as dates related to local OpenStreetMap gatherings. What are you planning to do with this information when you prepare the international versions? Manfred, Germany: We leave out any information that is only relevant for Germany – such as a regional conference – when we publish the international version. Our biggest deficit is the continuous observation of substantive contributions in important countries – such as Brazil and all of Latin America. Maybe the new talk-latam can reduce this gap. WN: Do you already have plans for how to advertise the international versions to the national OSM communities? How will you communicate with the national OSM communities? How will they know when a new translation is available? Madalina, Romania: Each week we announce the new issue via national mailing lists and Twitter. Our Spanish team subscribed to a lot of mailinglists all over Latin America, beside talk-es, and also to the new talk-latam. As for the Romanian OSM community, we also advertise on a public group on facebook which has very good visibility, OpenStreetMap Romania. Satoshi, Japan: As Madalina mentioned, I have posted announcements on Twitter hashtag in Japanese. I feel there is some need to issue “highlights” for very busy people. Anyway, I guess continuity is the most important & high value feature of this project. WN: What help do you need? Are there any “open positions” in your team? 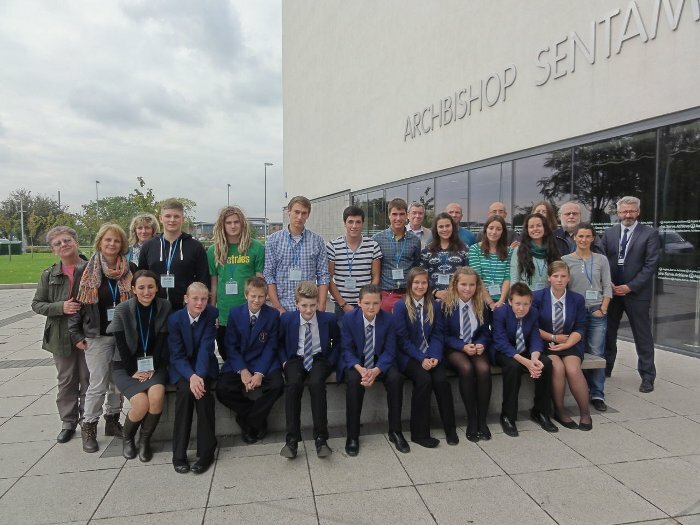 Anthony, United Kingdom: Team members from across the schools involved in the project have all played a valuable role in developing and updating www.weeklyosm.eu . Each school contributes in a range of ways depending on their strengths. There is a collegiate approach to the project which has been fostered through a shared understanding of our goals and mutual respect between our members. As such decisions made regarding the project are discussed openly before decisions are made. Although there is no official hierarchy within the team, it would be hard to deny that Manfred leads those of us who are less experienced with OSM well! We are always looking to develop www.weeklyosm.eu and volunteers to join the team to translate in languages not yet included on the site are always welcomed! WN: If interested readers would like to contribute a translation for an additional language, would this be possible? Who should be contacted for that? Anthony, United Kingdom: The popularity of www.weeklyOSM.eu is growing weekly. The site is getting hits from countries all over the world. It would be fantastic to be able to further develop the service and allow more people to be able to read posts on the site in their own language. We’d be very keen to be able to increase the range of languages Weekly OSM is published in. Just recently we were approached by by Satoshi who now translates the site into Japanese. Anyone interested joining the team and supporting with translating the Weekly OSM should contact the team at theweekly.osm@gmail.com. WN: Thank you very http://premier-pharmacy.com much for your time and effort! And all the best for your project! Questions by Stephan (German Wochennotiz team).